Looking around the cramped confines of Liverpool’s O2 Academy 2, we can’t help but think the Brummie five piece Swim Deep should really have their eyes on much bigger venues at this stage of their development. Their debut, 2013’s Where The Heaven Are We, failed to live up to expectations – aside from its utterly brilliant title. Their freshly-born new album Mothers, of which opinion is still coagulating, also displays glimpses of potential rather than a convincing build-up of momentum. Falling at the first hurdle, or in it for the long haul? Not living up to their hype, or defying expectations? Liverpool was about to find out. Support tonight came first from Glasgow’s Catholic Action and then The Magic Gang. 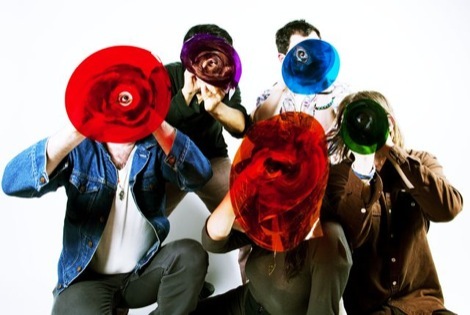 The former came across as pretty standard indie, albeit with some gravel to their distortion suggesting classic rock leanings. It’s more an influence than all-out foot-on-monitor pastiche however, with just a handful of 70s licks chucked about and some pleasing dual guitar action on display. It was a decent start for both the band and the night, even if a mainly mid-teen audience high on water and life decided to make their own entertainment for the most part. of keyboards and only requiring a slight bass setup tweak, as at times it thwacks dully rather than hops along. With some decent tunes and an EP out soon, they’re a cut above Catholic Action. Everything was winding up nicely then, for Swim Deep’s first Liverpool gig in two years. Despite a somewhat dizzying and more than a little concerning amount of phaser effects being soundchecked, the band take to the stage to the shrill delight of tonight’s youthful audience. 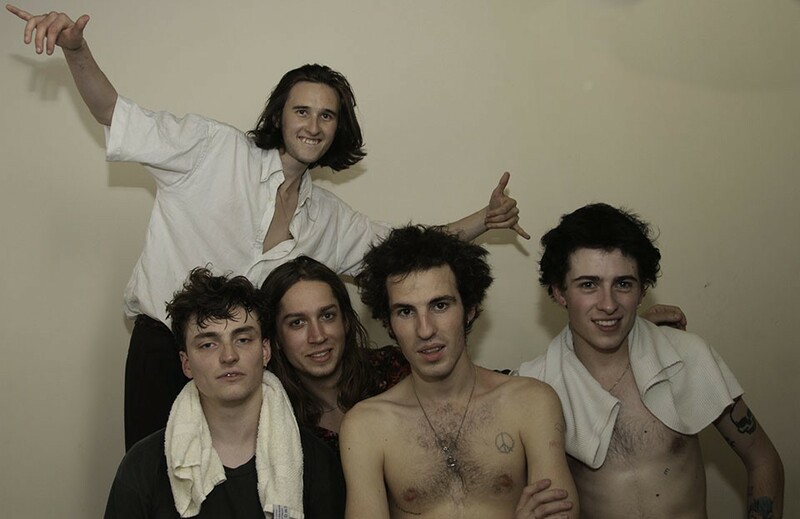 Zachary Robinson’s jaunty, stuttering drum part barrels opener Namaste along at a furious pace, its psychedelic turbulence a compass indicator for Swim Deep‘s shifting direction on Mothers. It’s their new record’s giddiest and most immediate dispatch, sitting well beside earlier material which immediately follows. Francisco’s two-note keyboard trill is really brought to life by Cavan McCarthy’s trawling burbling, bassline which provides a real depth, setting the song apart from its one-dimensional recorded version. Right from the outset, Swim Deep set a precedent that their two albums may be stylistic strangers, but marry up well when played live; a handful of songs are even given the sonic boost necessary to transform them from good to great. Not every punch thrown is a knockout. We got the sense that on a different night – with a different, more reserved crowd – sections of this set would’ve fallen flat. Count Is There Anybody Out There’s synth sax amongst weaker moments; similarly Red Lips I Know, which comes on all echoing guitars but grates when it reaches frontman Austin Williams’ screechy wigout. Despite Williams announcing its title, Forever Spacemen’s intro is moments later greeted with whoops of approval from the audience as if it were the last song of the night. That support soon dies away however, as another unwelcome cacophonous freakout crescendo is reached mere moments in, which resolves itself into a trippy Blur-esque plinky-plonk piano verse. Swim Deep seem capable of making some odd setlist selections and also some songwriting stumbles, meaning that for all the clever bass work and massive hooks – mainly delivered by James Balmont behind the keyboards – there are times in the evening which feel like a trudge, and sap even this boisterous crowd’s energy. Relatively minor criticisms aside, much of what the band offer is positive. One Great Song And I Could Change the World is great, a chanted intro giving way into blissed-out Balearic keys and a baggy, Happy Mondays-ish acidic vibe – all skanky riffs and wonky rhythms. Further into the set, the crowd respond instantly to Honey’s sparse riff, hands raised into the sweaty air for a unified chorus of “don’t just dream in your sleep, it’s just lazy”, followed immediately by a striding, uptempo version of King City. These act as the night’s real surprise, a pair of singles surely earmarked as set closers deployed right in the midst of things. Perhaps the band were conscious that the rest of Where The Heaven Are We was arguably crushed under the weight of those very songs, particularly as closing track Fueiho Boogie from new album Mothers is aired next. One giant tangled spiral of a guitar riff which sounds like a broken slinky descending a neverending flight of stairs, Fueiho Boogie’s eight minutes could have proven a dreadful, drawn-out indulgence. Thankfully Swim Deep engineer an expert amount of peaks and troughs into its running time, carrying both the crowd and performance along. By the time a frenetic electronic drum beat kicks in to conclude tonight’s main set, they had whipped the audience into a frenzy. A hypnotic carousel of psychedelia, it’s a masterclass in tension and release, serving as the evening’s unmitigated highlight. Although there’s no replicating what went before, the band return to the stage a short time later to play an encore encompassing singles old and new. She Changes the Weather goes down a storm and To My Brother is equally well received, a big, boingy Madchester keyboard part riding shotgun on a front of noise and feedback to close. Admittedly, this was a gig that we went into wondering what Swim Deep‘s unique selling point was; what makes them stand out from the legions of other soundalike UK indie bands? While that question perhaps wasn’t answered conclusively, the band are certainly well on their way to doing so. 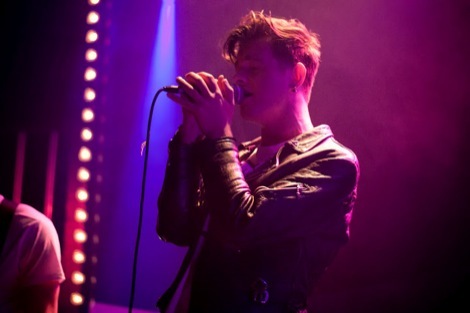 Any fears that Swim Deep are redundant in the crowded indie marketplace were allayed in Liverpool by their increasingly ambitious and impressive live sound. Swim Deep aren’t quite the finished article yet, but they’re making some great noises getting there. Picture by Getintothis’ Billy Griffiths.